Boldon CA secretary Kevin Oliver has revealed that the club have “full faith” in new manager Sean Butler. Butler takes charge for the first time when he takes his new side to Hartlepool FC in their Wearside League opener tomorrow. It hasn’t been an easy first month in charge for Butler after the majority of last season’s squad left the club. That has left him to oversee a complete rebuild with only two players remaining from the squad he inherited from the long-serving Paul Mossa. Oliver believes that Butler will need time, but is confident he will get it right this season. “It has been a full rebuild for the new manager and the season has maybe come too quickly for us,” admitted Oliver. “We didn’t know players were leaving until around three weeks ago and we have had a lot of trialists with us. “We are trying to get players in but that could take up to a month now. Defender Oliver Bone will miss the trip to Greyfields as he is suspended. Hebburn Town Reserves manager Kevin Bolam has a number of absentees for their away game at Darlington Town. 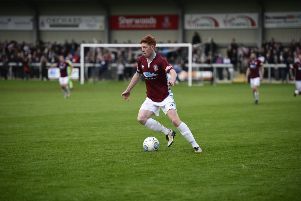 Bolam has revealed that he is without injured trio Jonny Bainbridge, Tom West and Frankie Hucks and midfielder Aaron Williams is on holiday. New signing Aidan Grant is rated as doubtful with an illness. Bolam’s side face a testing start to the season, but the Hornets boss is looking forward to getting underway. “We have a very tough start and we have to play six of our first eight games away from home. “We have a poor record at Darlington so we hope to put that right on Saturday. Harton and Westoe CW face a trip into the unknown on the opening day of the season as they travel to Wearside League new-boys West Auckland Tunns. They travel to County Durham in positive mood after some impressive performances in pre-season. Midfield Chris Foster is injured, but manager David Crumbie could hand debuts to goalkeeper Gary Frater, defender Seb Hanratty and former Jarrow midfielder Paul Burrell. Gateshead Leam Rangers get their season underway with a home game against newly-relegated Darlington RA. 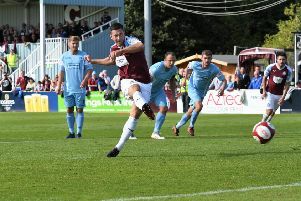 Leam Rangers boss Anth Huddart is withouth former Ashington and Morpeth Town midfielder Shaun Bell and defender Chris Lowther after the duo both suffered groin injuries in pre-season.